Dynamic Therapy Solution - Contract Home Health Therapy Management Software for Physical Therapy (PT), Occupational Therapy (OT) and Speech Therapy (ST). 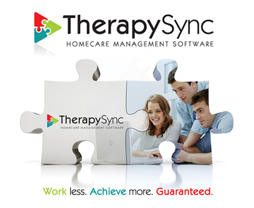 Dynamic Therapy Solution has the leading home therapy software product which is specifically designed and built for therapists working for multiple nursing agencies. It is designed for online(web-based) and offline (no air card needed) use. We have cutting edge technology that allows for system syncronization of electronic notes along with any changes made to the electronic patient record while in the field. What this means is no need for expensive "air cards" that cannot be relied upon. Dynamic Therapy Solution is a SaaS (Software as a Service) which is Medicare/HIPPA compliant and what this means is that you pay one fee for intial setup and licensing of your system and a low monthly fee for EVERYTHING else! No extra unexpected charges for hosting fees, costly tech support expenses or mandatory upgrade charges... it is all included in the service. We have real electronic signatures, not a pin code or rubber stamping of signatures. No faxing or emailing of notes. The customers which you give access, can print their patient's notes off of your website and view the electronic patient record for schedules and frequencies (no downloading software or special equipment needed). They can see which therapists are involved in the care and even send them secure internal messages. 1)therapy company administrators 2)therapists and 3)nursing agencies. Click here to view the features & benefits of all three! See for yourself how easy it is to automate your Home Health Therapy business - and END your paperwork nightmares. We have revamped this past year. Be the first to see it! Need a home exercise program (HEP), no worries - we have you taken care of. If you need to meet with decision makers regarding our software, click the link to download a packet. Check us out in the latest Home Health Section Newsletter. Are you a member? Many of our customers have doubled their business since purchasing the software. Having access to our software, you will have all the proven tools needed, along with the guidance from a real live professional that has been in the business for many years to bounce your ideas off.